Sizzled in a pan over a medium heat we found is the best way to cook them. You could oven cook or grill but we think they would dry out a tad, mind you, give them a go even on the BBQ and let us know if you find different. Weight loss pan fried is on the noticeable side but with the red wine there's quite a bit a bit of moisture on board initially that will cook off. Meat percentage content of the outdoor reared Essex pork may have reduced slightly since last time but 80% is still very good as far as we are concerned. 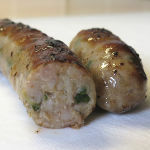 The breadcrumbs in the mix rather than rusk hold moisture and create a very succulent sausage that from the aroma from the pan just screams eat me, eat me! BUT BE WARNED, don't add any sauce, ketchup or mustard as you'll spoil the taste, trust us! 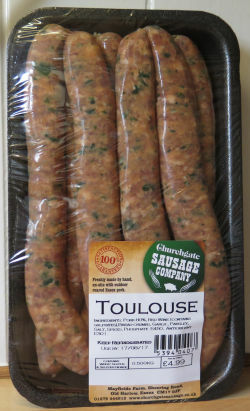 Churchgate Toulouse are a long sausage of almost chipolata proportions, yes OK we do give them a twist to the quality natural skins to make two shorter ones from each big one. Yeah yeah, go on, say we've spoilt the concept of the Toulouse. Well we don't mind at all as it makes sure there's some for everybody to taste at party time. 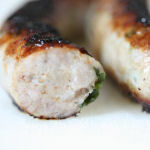 The taste is key though and these sausages are not short on such. You definitely get a buzz from the spices and warming glow of the garlic, with the deepness of flavour of the red wine. One or two of the "girlies" here found them a bit too strong for their taste, but us oldies really liked them...even eaten cold later is interesting although be ready, the deepness of the wine and garlic flavouring seems to increase a tad. 200x20mm before cooking, 180x20mm after. 63g before cooking, 53g after.